While I've been using training pants with my 2-year-old son, nothing beats the absorbency and reliability of a diaper. We used Pampers for many of our children, and I have enjoyed seeing the brand evolve over the past few years to make their diapers more streamlined, less bulky, softer, and more absorbent. We buy size 4 Pampers Cruisers for my son to sleep in, when we go on long car rides, or for days I know he has given up on potty training. He adores the Sesame Street characters and how soft the diapers are. I like that they never leak and they are slim under his pants. At a time when diaper prices can fluctuate so rapidly, it's nice to have a solid price for diapers in my budget. 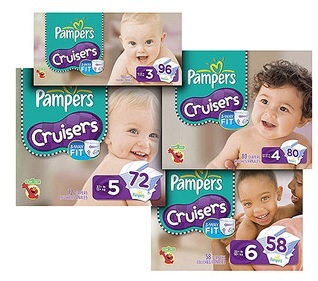 If you're a Pampers fan and you use P&G products, the bonus savings coupons are a great way to save additional dollars on your household's expenses. You can also find the $25 boxes of Pampers in Walmart stores through the end of April!